Now here’s a topic that’s so basic I can’t believe I haven’t done it yet. Sheesh. The Arabic verb “to thank” is شَكَرَ (shakara), which also means “to be thankful.” After last time you should be familiar with the idea that you can take this root and derive other words from it, yes? Well, شكر has a pretty limited set of applications but the vocabulary is useful nonetheless. “Thank you” is شُكراً (shukran). “Thank you very much” or “thanks a lot” is usually شُكراً جَزيلاً (shukran jazīlan), though colloquial variations do exist. Technically the full phrase is شُكراً لكم (shukran la-kum, “thanks to you”) but the specification “to you” is almost always omitted except in very formal talk. That structure at the end, the اً (-an) is something we should talk about. It’s called a تَنوين (tanwīn), and it is the indefinite marker (i.e., it means you’re talking about “a” thing and not “the” thing). It’s written as a doubling of the final short vowel (which determines case: ُ marks the nominative, َ marks the accusative, and ِ marks the genitive–we can maybe cover this at some point in more detail). When a noun in whichever case is indefinite, it ends with a تنوين in the appropriate case, and the effect is to add an “n” sound after the vowel. For the فَتحة (fatḥah), however, you can only add the تنوين directly to the feminine marker (ة); for all other letters you have to also add an alif (ا) and then tack the تنوين on to that. The reason I haven’t really mentioned this before is that, in everyday speaking, you almost never articulate the case endings to anything (nor would you usually encounter them in writing since short vowels are usually omitted), but in the case of شُكراً it is always spoken. Other useful words that derive from شكر include the passive participle مَشكور (mashkūr), “worthy of thanks” or “praiseworthy,” the active participle شاكِر (shākir), “thankful” or “grateful,” and تَشَكُّر (tashakkur), which also means “gratitude” or “thanks” but is more emphatic and is really important when we come to Turkish (and Persian, though it’s less important there). There’s also مُتَشَكِّر (mutashakkir), which also means “grateful” or “thankful” but doesn’t come into play much in Arabic (it’s more important in Persian). The response to شُكراً, usually, is عَفواً (ʿafwan), and note that this also vocalizes that indefinite ending. The verb عَفا (ʿafā) means “to excuse” or “to pardon,” and the expression عَفواً can be used when you want to say “excuse me” or “pardon me,” but it also means “you’re welcome” in a “don’t mention it” sense. The way this blog ought to work, if it were really “Arabic Word a Day” like I named it, is that in between all the special holiday occasions when I write long, periodically interesting things about whatever occasion is at hand, and the grammar lessons, which I hate writing as evidenced by the fact that it’s been months since I wrote one, we’d also cover, you know, words. Just random words, whatever, pick a root out of the dictionary and toss it up there on the old tubes. That’s the way it ought to work, but of course it doesn’t. Except for right now! Let’s take a look at an Arabic root, جمع or J-M-ʿ. You should know, or recall from reading it here, that the basic unit of Arabic, and indeed all Semitic languages, is not the word but rather the root. A root is like a word in that it’s an arrangement of letters, in Arabic usually three of them, that represents a thing or idea, and in fact every root is its own word (provided you add some short vowels). But roots are more than just the one word; if you know the right patterns, like the various verb forms or the ways in which participles are formed, you can plug in any given root and derive a whole bunch of other words that are related in some way to the original definition of the root itself. This evening marks the second religious festival of the Islamic calendar, after the Festival of the Breaking of the Fast, عيد الفِطر (ʿīd al-fiṭr, Eid al-Fitr), that follows Ramadan. It is called the Festival of the Sacrifice, عيد الأضحى (ʿīd al-aḍḥá, Eid al-Adha), and is the more important of the two, informally known as the “Greater Eid” (عيد الكَبير, ʿīd al-kabīr). The festival commemorates an event that should be familiar to anybody who has some knowledge of the Bible, the episode in Genesis known as the “Binding of Isaac” (Genesis 22). God commands Abraham to sacrifice his son and Abraham, understandably conflicted, ultimately chooses to obey God even at the cost of his son, only to have an angel stop him just as he’s about to kill the boy, Abraham having proved his devotion to God by his willingness to obey even such a difficult command. This story was retold in the Qurʾān (37:100-109) and is part of the Islamic narrative about Abraham (إبراهيم, Ibrāhīm). Mainstream Islam says that it was Ishmael (إسماعيل, Ismāʿīl) who was supposed to be sacrificed by Abraham, rather than Isaac (إسحاق, Isḥāq “is-haq”), though early Muslim scholars argued over this point because the identity of the son is not specified in the Qurʾān’s version of the story. Eid al-Adha is intimately connected with the annual Hajj pilgrimage to Mecca, which is itself very closely connected to the Islamic narrative of the life of Abraham/Ibrahim. If you’re familiar with the rituals of the Hajj then you know that the pilgrims celebrate Eid al-Adha after descending from Mount Arafat and returning to Mina, where they stone three pillars or walls meant to symbolize the three times that Satan attempted to sway Ibrahim from obeying God’s command, then segue into the traditional festival celebration. Muslims around the world, not only on Hajj, celebrate this festival at the same time. Our discussion of the customs and rituals involved with this Eid will focus on what believers who are not on Hajj do to commemorate the holiday. The celebration has its roots in the Qurʾān (2:196), which commands that all believers who are not on Hajj nevertheless commemorate this festival with animal sacrifice. It is the sacrifice of the best herd animals, often cattle, but also other حَلال‎ (ḥalāl, “lawful”) animals like sheep, goats, camels, etc. (not pigs, obviously) that marks the festival. These “sacrificial” animals are called أضحية (aḍḥīyah). Tens of millions of animals are slaughtered worldwide over the holiday, and their meat is divided into three parts: one for the family to keep, a second to give to friends and relatives, and a third to be given to the poor. No Muslim is allowed to go hungry during the festival, and it is incumbent upon all Muslims of means to provide for the poor. I am here neither to condone nor condemn the sacrifice, though I will note that these animals are killed for food, not enjoyment. I am also not here to render a discourse on how humane halal butchery is or is not as compared with Western methods. Just here for the vocabulary and a little context. There are other customs around the holiday. The celebration begins with a special Eid prayer, to be performed after the sun is fully risen but before the noon prayer. This must be performed in a communal mosque if at all possible. The holiday usually lasts at least 4 days, but local custom may extend it beyond this (I think the UAE takes at least a week, for example, but I don’t know how many days other places celebrate). Friends and family members will visit one another and offer Eid greetings. The same greetings that are used for Eid al-Fitr also apply here: عيد مُبارَك (ʿīd mubārak, Eid Mubarak), “Blessed Festival (Eid)” and عيد سَعيد (ʿīd saʿīd, Eid Saeed), “Happy Festival.” Gifts are often given to children, something simple like candy or a little cash. If you’re reading this, and pending the observed phase of the moon (as with every other annual Islamic event, which if you recall are dated according to the lunar Hijri calendar), then presumably the Hajj pilgrimage has either begun or is about to begin. Here we’ll talk about the Hajj and look at some relevant vocabulary. I will add some Persian and Turkish pilgrimage vocabulary as well. You can also find more information on Islamic pilgrimage in general at my regular blog. The Hajj (الحَجّ) is a group pilgrimage to the city of Mecca (full name: مكة المکرمة makkah al-mukarramah, “the Honored Mecca” or “the Holy City of Mecca”), in the western region of Saudi Arabia known as the Hejaz (الحِجاز, al-ḥijāz). It is, with the exception of Ramadan, the central event of the Islamic calendar. Its completion is one of the Five Pillars of Islam, and every able-bodied Muslim who can afford the journey is obliged to make it at least once in his or her life, though Sunni women below the age of 45 must be accompanied either by a husband or a مَحرَم (maḥram), a male relative (blood or in-law) who could not legally marry her (brother, son, father, etc.). Shiʿa women are permitted by Saudi authorities to make the pilgrimage on their own, provided that their own government allows it. The annual Hajj is meant to repeat the pilgrimage of Muhammad and his followers from Medina (full name: المدينة المنورة al-madīnah al-munawwarah, literally “the Radiant City”) to Mecca in 632, the first truly Islamic pilgrimage during which Muhammad taught his followers its ceremonial rites. However, that pilgrimage was itself rooted in pre-Islamic Arabian practice; Mecca was a regional holy site long before Muhammad began preaching, something that Mecca’s merchant community used to its advantage in boosting commerce. Legend says that the pilgrimage was founded to commemorate the struggles of Hagar (هاجَر) and her son Ismāʿīl (إسماعيل, the Biblical Ishmael), who wandered in the desert after being cast away by Abraham (إبراهيم, Ibrāhīm) and Sarah, nearly died of thirst, but were saved when God opened a well for them, the Well of Zamzam (زَمزَم), in what is now Mecca. Historically Muslims journeyed to Mecca via Hajj caravan, both as an expression of group solidarity and for safety. Both imperial and local rulers were at pains to see that any caravans that originated in or passed through their territories were protected, and failure to do so could lead to diplomatic crises if the subjects of another ruler, or if the practitioners of a powerful ruler’s particular branch of Islam, were harmed during the journey. Nowadays, of course, we don’t do things by caravan very much anymore, and most of the ~1.5-2 million pilgrims who come from outside Saudi Arabia (Saudi officials set limits by country in order to keep each year’s pilgrimage at least within the realm of manageability) do so by plane, landing either in Medina or (more commonly, since it’s much closer to Mecca) Jeddah. The pilgrims then process from these cities on to Mecca, camping in the desert at night. The rituals include the requirement that pilgrims enter a sacral state of bodily and spiritual cleanliness, known as إحرام (iḥrām). This includes wearing very simple white robes and avoiding any scents like deodorants, cologne, perfume, and scented soaps (unscented soap is provided to pilgrims for bathing, which is also part of the iḥrām requirement). It also demands that the pilgrim cleanse his or her mind of negative/impure emotions and thoughts and that he or she abstain from things like smoking, swearing, killing animals, and quarreling. After arriving in Mecca the pilgrims then act out a series of rituals meant to commemorate the lives and experiences of Ibrahim, Hagar, and Ismaʿil. First they perform a طَواف (ṭawāf), or circumnabulation (moving around a sacred object) of the Kaaba (الكَعبة, al-kaʿbah), the large black cube-shaped (it’s not a perfect cube) structure in the center of the Masjid al-Haram (المَسجِد الحَرام, al-masjid al-ḥarām, “Mosque of the Holy Place”), seven times. Ibrahim and Ismaʿil are said to have built the Kaaba together after being commanded by God to build a structure where He could be worshiped, and the tawaf, done by all pilgrims in harmony, is meant to symbolize the unity of the Islamic community in its worship of the One God. The Kaaba is covered by a cloth, called the Kiswah (كِسوة), which is manufactured every year; each year’s cloth is cut into pieces and given to pilgrims, dignitaries, and Islamic organizations. It is possible to go inside the Kaaba–it’s a nice looking if fairly nondescript thing from the photos I’ve seen–but not during the Hajj. There are just too many pilgrims for such a small structure to handle. The Kaaba has a fascinating history, or at least legend, around it. Though it was built by Abraham and Ishmael as a place of worship for God, the story goes that as Mecca’s people got further away from their roots they began to worship multiple gods and store idols to those gods in the Kaaba. They even dedicated the shrine to one of those deities, Hubal. When leaders of the Quraysh, Muhammad’s tribe and the dominant tribe in the city, surrendered Mecca to Muhammad and his followers, Muhammad is said to have entered the Kaaba and smashed the idols in order to rededicate it to the monotheistic God, ostensibly its original patron. After prayers in the mosque, pilgrims perform the سَعي (saʿī), during which they run back and forth between two hills in the mosque courtyard, Safa (الصَفا, al-ṣafā) and Marwah (المَروة, al-marwah), commemorating an episode in which Hagar is said to have run frantically between those hills searching for water to give to the infant Ismaʿil before God revealed the Zamzam well. Drinking water from the well is part of the ritual. The next day the pilgrims process to Mina, a neighborhood outside Mecca, and spend the day in prayer, camping there that night. The following morning they journey further outside Mecca (now around 13 miles outside the city), to Mount Arafat (جَبَل عَرَفات, jabal ʿarafāt), where Muhammad gave his final sermon during that first Hajj in 632. They spend the day in prayer, reflection, and reciting Qurʿan. This ritual, called the Wuquf (الوُقوف, al-wuqūf, “stopping,” or “standing”) is the centerpiece of the pilgrimage (failure to spend the day at Arafat renders the whole effort moot). That night the pilgrims sleep in the open air in an area about halfway on the trek from Arafat back to Mina. The next day they return to Mina and participate in the commemoration of Ibrahim’s near-sacrifice of Ismaʿil (this is the Biblical Abraham-Isaac story, but according to Muslim tradition it was Ismaʿil who was to be sacrificed). They throw stones and pebbles at three walls (which used to be three pillars) that symbolize the three times Satan tested Ibrahim’s faith and willingness to sacrifice Ismaʿil as God commanded. The “Stoning of Satan” (رَمي الجَمَرات, ramī al-jamarāt) leads into a celebration of the Festival of the Sacrifice or Eid al-Adha (عيد الأضحى, ʿīd al-aḍḥā), which is celebrated by Muslims worldwide. 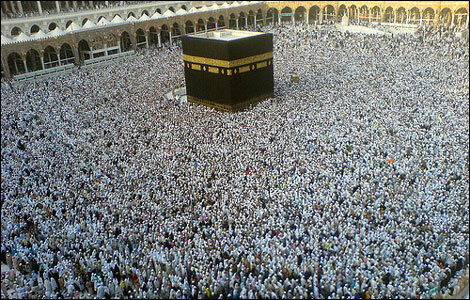 The pilgrims return to Mecca and complete at least one more tawaf (usually two) before leaving the city. Though it is not technically part of the Hajj, quite a few pilgrims will (either before or after the Hajj) visit the Jabal al-Nour (جَـبَـل الـنُّـوْر, “mountain of illumination”), just outside of Mecca. The Jabal al-Nour contains the Cave of Hira (غَـار حِـرَاء, Ghār Ḥirāʾ), where Muhammad regularly meditated and is said to have received his first revelation. Many pilgrims will also avail themselves of their proximity to visit Medina, where they will see the Prophet’s Mosque (المَسجِد النَبَوي, al-masjid al-nabawī) and other important sites like the Mosque of the Two Qiblas (المَسجِد القِبلَتَين, al-masjid al-qiblatayn). This mosque is where Muhammad is said to have commanded his followers to stop praying in the direction of Jerusalem and start praying toward Mecca and which consequently had two prayer niches (قِبلة, qiblah, the marker in every mosque showing the direction that the worshipers should face) until the Saudis destroyed the one facing Jerusalem. Travelers might also visit Muhammad’s grave, located within the Prophet’s Mosque, and graves of other prominent figures in the early Islamic community (أمة, ummah), or at least the ones that the Saudis haven’t yet bulldozed. Those who have completed the Hajj earn the right to be called Hajji (الحَجّي) and may be greeted with a simple الحَج مُبارَك, “Hajj Mubarak” (“Congratulations on the Hajj”); more ostentatious welcomes or greetings would run counter to the spirit of the pilgrimage, of humbling oneself before God.